K. Shawn Edgar's long-running KBVR show, Northwest Morose is an eclectic blend of artistic drama and outrageous comedy. Dedicated to showcasing the creative genius of the amateur video producer, both submitted movies and award-winning original pieces are presented in the program. Over the years, this show and Delusions have been very connected, with Alan co-hosting this show, and KShawn co-hosting Delusions. The final episode of the show, American Peephole, was a co-production. With so much crossover, a separate page has been set up to cover it all. A new show produced by ex-Bravado member Paul Pistey, Shameless is "a ripoff of Delusions of Grandeur," to quote Paul. Also named after a Pet Shop Boys song (Shameless was what Alan was originally going to call Delusions), it's a mix of hosted introductions, festival-esque submissions, and comedy sketches. It also features some Plan 11 style real-life comedy bits. Anyway, since the show is occassionally set in Paul's office (where Alan's stuff is), lots of his props show up in the show. Here's a shot of Paul's favorite two props - the gun and the 216 glasses. Plan 11 Presents is the latest big show on KBVR-TV. Produced by Alex McNall, it is a show in the Delusions of Grandeur mold, with a running continuity and lots of recurring sketches. Plan 11 also pulls a lot of on-campus pranks, including dressing up as security guards and hassling people, and going out on Valentine's Day to beg for dates. Alan wrote a sketch that will appear in an upcoming episode, but for now the only Bravado stuff that has appeared on the show is a ton of stuff out of the prop library. In the shot at right, you can see the Evil Alan coat, the glasses, gloves and vest from Gauntlet 216, the rain poncho from The Folk Singer, and various other stuff. A new show at KBVR-TV, the original cast of Legends & Monsters featured Tony Chung and Alex McNall. 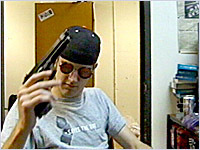 The producer of the show borrowed a prop gun from Alan's office, and when Alan went up to get it back, he ended up doing a scene with Tony, as a friend who thinks that Tony killed Alex's character, when it was really alien assassins. Or something. The movie, Alien Madness, became the first episode of the show. It was also the only show that KBVR refused to air because it was so poorly produced. After a few months of shooting all new episodes, Legends eventually did make it on the air. The producer has taken all footage of Alien Madness and hidden it, though, so you'll just have to settle for this embarrassing picture of Tony instead of a pic from the actual scene. After the demise of both incarnations of the Brock Jacks show, Warren got to do a show all his own. The Funeral (or, alternately, Warren Blyth's Funeral), was an experimental show of sorts, featuring lots of strange editing, gothic and industrial music videos, and other Warrenesque strangeness. Lasting four episodes before Warren's graduation, this show has also disappeared from the KBVR vaults. Though, that's more due to Warren not being able to find where he put them than anything else. Theater of War was a drama / comedy / kung fu show produced by Jonason Ho. Jonason and Warren hosted, with Jonason as a secret agent of sorts and Warren his Q-esque technician. In between their segments, Jonason introduced clips of Jet Li movies, straight out of China. Unfortunately, Jonason only got through three episodes before graduating. Unhappy with the way those episodes turned out, he pulled them from the vault. Copies of the show no longer exist. The Best of KBVR-TV was an anthology series of sorts. Produced back when KBVR had more than one or two popular shows, it started in 1998 as a straight clip show edited by Alan. Eventually, it developed its own continuity and hosts who introduced the clips - Alan, KShawn and Warren. It was in this show that we covered Warren's return from California, and the conclusion of the whole anti-Barometer thing - in the last episode KShawn builds a bomb and blows up the Barometer, killing the hosts in the process. Many Bravado members actually got their start on The Comedy Show, only to jump ship and join us, including Case Bowman, Kim Turpin, Andrew Link, Paul Pistey, producer Sean O'Donnell-Field, and even show creator Casey Campbell. Alan also made a guest appearance on the show in an improv sketch produced by James Allen. Playing a character very similar to the one he played in Jonason's Star Wars fan mockumentary, Alan was interviewed by Case Bowman about Delusions and his obsession with toys. Initially too embarrassed to watch it, Alan was fairly amused by the sketch when he finally did see it two years later. Adventures in Learning is a summer program for middle school students, and one of their classes was held at KBVR. 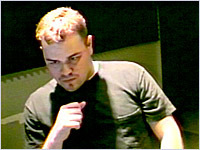 Stew Young headed up the program through most of the late 90's, and Alan was one of his main assistants. Other instructors included Charles Lind, KShawn, ODF, and Casey Campbell. Alan helped the students on some popular pieces, including the award-winning short Tinytanic. 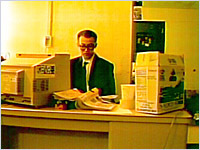 A show produced by Bravado Entertainment, it featured Brock behind a desk reading jokes cut in between vintage movie trailers and other ads. Alan co-produced with Brock for four episodes, also directing and editing. He quit after those four episodes and turned it over to Warren Blyth, who renamed it Mid-Mourning with BJ and the Bare. After another four episodes (most of them Brockless), Warren left to produce his own show, The Funeral. Along the way, Bravados like KShawn, Andrew Link and Charles Lind made appearances. KShawn actually produced this show - and I'd still like to hear the story of how that happened. Anyway it featured college girls in a 'The View' esque setting discussing important world issues like fashion and TV. Amazingly, it lasted only two episodes. A one-off special produced by Mike Stevens, this show presented pre-Challenger disaster documentaries produced by NASA as a look at the direction of the space program then in contrast with now. Alan directed the studio segments and did the chroma-key effects. 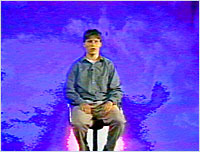 Eskaton was the first new KBVR show after the end of Broadcast Media at OSU (Delusions was the second). It was Brett Lunceford's Industrial music video show that also featured interviews and concerts with bands like Pigface, KMFDM, and so on. Alan helped out on a couple of occasions - most notably shooting the Curve / DJ Accucrack / Dandy Warhols concert show. Warren Blyth was actually recruited through this show as well. But, the only person to make an appearance on the show was KShawn, who appeared in Brett's video Queer. Shawn followed a crucified Brett around, whipping him in the middle of the quad. Kim Turpin's parody of The Real World, Limited Reality was a fake (as opposed to the completely real and authentic... right) version of the MTV series. In one episode, one of the characters goes to anger managaement therapy. His therapy group was a host of cameos, which included both Alan and Casey Campbell. KBVR Sports Extra was Jeff Bennett's SportsCenter type news program that also featured interviews with OSU athletes and coaches. For Jeff's final episode, Alan lended a hand, running the camera and making an appearance - taking away Jeff's desk to make lightsabers out of it. Alan also helped Jeff out on some OSU women's basketball games by running a camera, and edited an episode of the show. Out and About was a local showcase program. As a part of their series of spotlights on other KBVR shows, Alan was interviewed to plug Delusions and the upcoming Vanilla Ice appearance. The first show that let Alan make 'guest appearances', he took full advantage of the live format. In their first appearance, Alan and Jason surprised everyone by showing up to promote the show, but instead pretended to get into a fight on-camera. In the second appearance, Alan ran on after a newsanchor poked fun at Vanilla Ice's appearance on Delusions. He took then-weatherman Casey Campbell hostage, but another anchor decided to end the situation quickly by kicking Alan in the groin.